Tip O New England To Ye! ...Maine nature love. 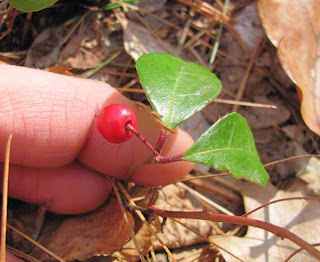 This right-brain post is a slew of nature shots from a recent trip up to Windham, ME. Captions when necessary. And no worries, we'll have a more story-based post this weekend about blueberry picking, beermaking, and gardening! A clever creature's freshwater clam midden atop sunken trunk island. Sun turtles doing what they do best. "Thank you for zzzzaving me from the water zzzurface!" mantis are so perfectly beautiful... it's poise. An easy mystery to solve... which butterfly chrysalis? ID correctly to claim a MAILED prize! Mi Scusi, Scutigera! Will you terrorize my mother? If you'd seen the name written in a list of house-dwelling bugs, you might imagine it a potentially charming, dignified, Italian paisano of an insect; perhaps riding on a Vespa's handlebars and squeaking "Ciao!" While it is endemic to the Mediterranean region, it's been around North America since the mid-1800's. And unfortunately, after seeing its picture, no doubt I have to win you all back from your recoiled positions atop your favorite reading chairs. Indeed, mom's not happy at me for making her scream; I shrieked suddenly and grabbed at her when she leaned in for a closer look at the captured creature. Her fear was only skin deep, haha! Personally, I don't believe in using people's fear to build suspense; if I'm not afraid, you (usually) shouldn't be, either! Why would I want to encourage unnecessary fear? But I went that way with this post title because Americans get a tax credit for referencing "terrorism" in any form (helps the war effort). Gotta... pay... the mortgage? Politics aside, this cute "bug" is a type of centipede (Phylum Arthropoda, Class Myriapoda, Order Chilopoda), called a House Centipede (Scutigera coleoptrata). Like other centipedes, the front-most pair of legs is modified to inject venom used to kill prey. Exceptionally rare stings would be no worse than a bee's. Of course I wasn't certain of that yet when I was outside taking photographs (sometimes, research comes second). Thus, another terror for mom when I ran inside shouting "I need to check that it won't kill me before I go ahead and hold it." What many people forget about "wild animals" (another weird term to me) is that the tools they use to attack are not always what they use to defend. Scutigera defend themselves by being nocturnal, living in narrow places, and detaching legs if they are caught. The venom is for catching prey. Thus, when staring down a human, the threatened Scutigera will scoot away as fast as it can, towards dark shadowy places. It will not attempt to bite its way out like an outlaw gunslinger shooting up a wild west canteen when the sheriff arrives. Don't you see the cuteness now that you're not scared? Though these may live for seven years, they never get larger than a couple inches body length. The 15 pairs of legs do make them look longer, to be sure; perhaps a whole hand's length! But it's the length of the last pair just acting as camouflage; by looking like long antennae, the creature looks larger and disguises which end is its head. You would do much better than squishing them by leaving them be, perhaps even offering a courteous little bow when you see these specialized hunters running through your house. They are there only because it is moist, unfrozen (in seasonally frozen northern states, they only live in houses) and there are lots of other bugs to eat (which they catch by jumping on them or lassoing them with their long legs). And if you're not gonna drop your fear of bugs, know that this little scooter - or "snallygaster" as one internet nature lover recalled their grandfather's term for it - is your ally, hunting down the spiders and carpenter ants and beetles that (may) also annoy you. Something for everyone! *A Scutigera spreads preening fluid from maxillary glands over its cuticle. I.e., it's Windex-ing it's legs to stay fast and clean. Like waxing a fancy Ferrari to increase performance - visual, aerodynamic... Being the best this bug can be. ...And that's why to remain respectful, I always release creatures back where I've found them (see video, lower). Especially for northern snallygasters, where I know they will not survive the winter outside! Just nobody tell my mom, OK? Having traveled much and judged little, I find myself with many interesting friends. T is a close friend from my Saudi Arabian alma mater who was often by my side when pushing the limits of legality and safety for the sake of incredible nature adventures. 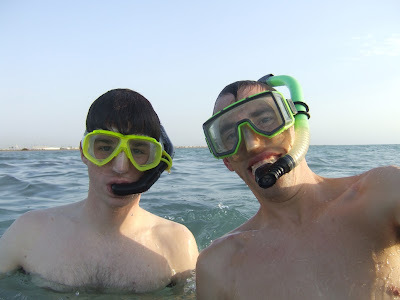 The photo of us in snorkel gear below may not look like much, but it was taken our first month on campus; high fences with barbed-wire blocked all access to the beach, which was strewn with construction waste. It was T who was willing to join me in creatively circumventing the "red zone" to discover the local sea creatures. As risky adventurers are wont to do, T decided to take a spontaneous trip from Taiwan (where he lives now) back to his home country, specifically up to New England to visit... me! He has never been to this region of the USA, so I knew I had to take him to some special places. Purgatory Chasm in Sutton, Massachusetts seemed right. It's a granite bedrock hillside that appears to have been split apart, forming a deep gash with rock walls 70 feet high in some places. It may have formed when a geological fault stressed the rock to crack, which was later exploited and pushed apart by glacial action. I have been to Purgatory many times before with many people; I enjoy climbing the tallest rocks overlooking the chasm and conversing with my guests in the shady cover of adjacent pine and hickory canopies. Red squirrels (Tamiasciurus hudsonicus) and chipmunks can be seen running among the rocks, and wild wintergreen plants (Gaultheria sp.) growing on the outer perimeter of the chasm offer the achy hiker a tingly and mildly pain-relieving treat to chew on. 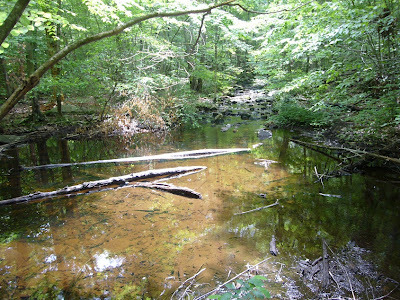 The area is excellent for spotting wildlife; some of the rarer of Massachusetts' 10 freshwater turtle species (6 of which are endangered) could be found here, as well as the Lady's Slipper (Cypripedium acaule), a beautiful temperate orchid, which blooms in late spring. We were neither pushing our limits nor searching for creatures with scientific intensity. Just enjoying ourselves and catching up in the kind of environment we have always preferred. The entire chasm seeps a somber, ancient, instinctual feeling; even on the hottest of days, it is a cold shady grotto. The huge boulders forbid too much sunlight from entering the chasm, and shadows lead the way around rocks so thickly covered by soft green moss that our modern mind must make an active decision not to curl up atop them for a nap. Out the back of the chasm, a trail leads to a smaller outcropping of rocks called "Little Purgatory." 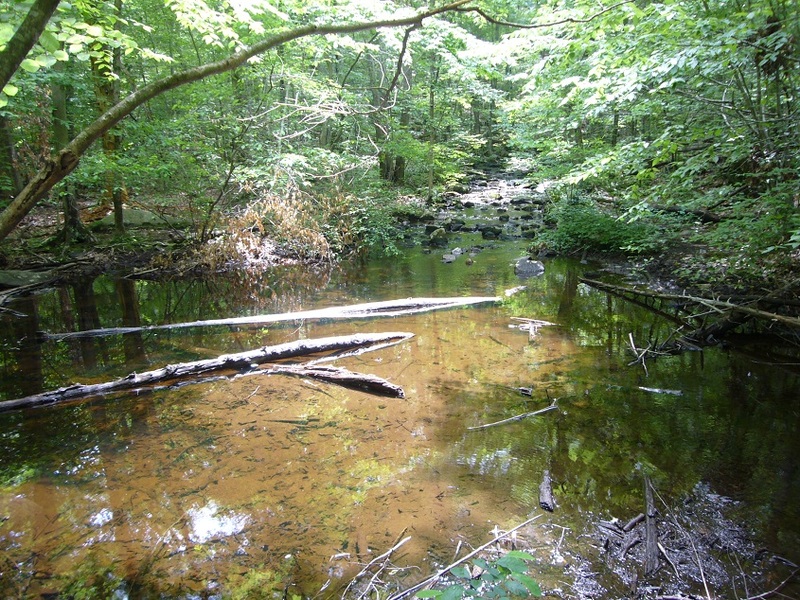 A brook bubbles over the rocks here, accumulating in pools too shallow and small for any fish. Such a location is a haven for smaller aquatic creatures, and when T and I arrived we counted nearly a dozen frogs warming themselves in the sun. A life of studying underwater creatures meant I could not resist a closer look. 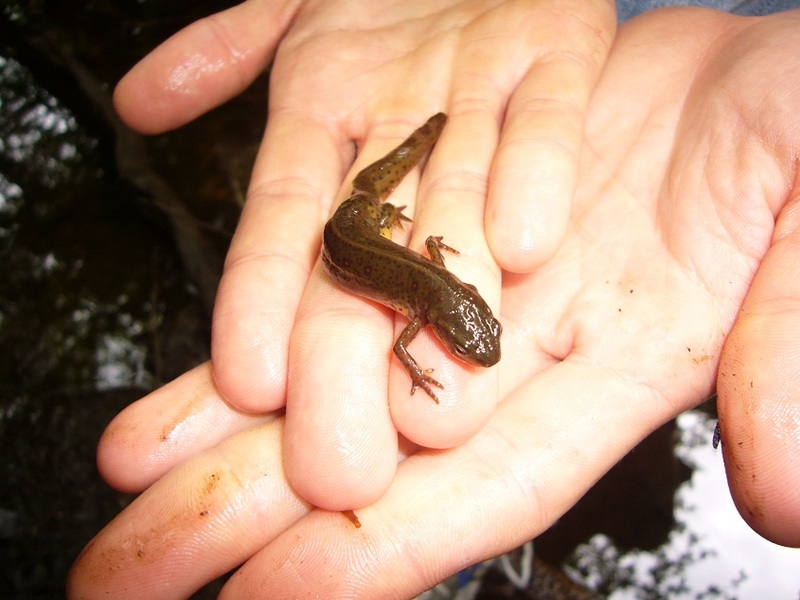 Discovery came when a brown silhouette on the brown silty bottom materialized into a recognizable shape - a salamander! I was immediately agog. 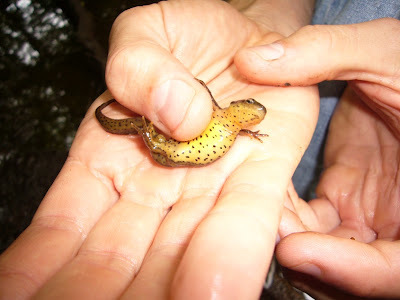 I had not seen a wild salamander before, but I remembered how badly I wanted to find these mystical creatures when I was a child; my true-to-life plastic salamander replicas were among my favorite toys. How ironic that I'd forgotten all about them since becoming a fully-developed nature hunter... Salamanders are from the amphibian order Caudata, with 600 species worldwide in 10 families. 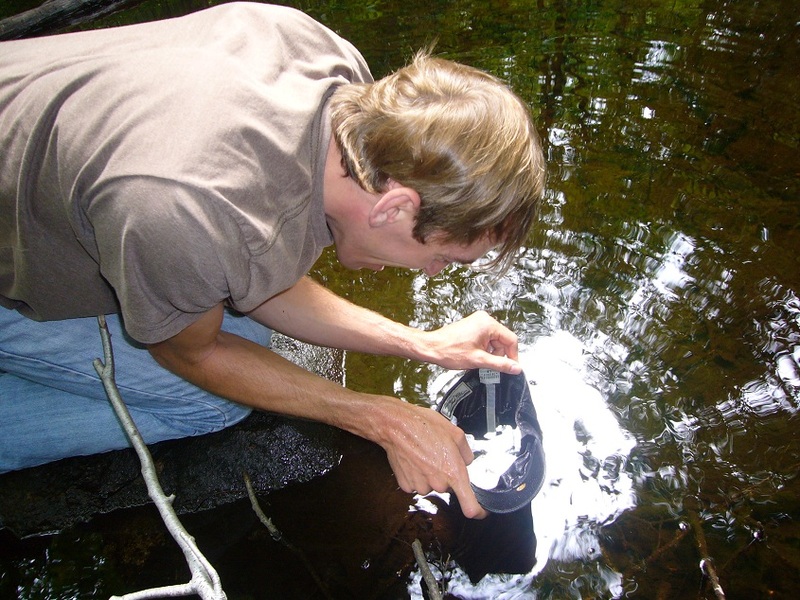 There are 11 species known from Massachusetts, including 5 representatives of the Plethodontidae, a lungless group that gets all their oxygen by diffusion across their moist and thin amphibian skin! Though I try not to interfere with wildlife out of respect, I am also a curious, experienced, and very gentle wildlife biologist. I decided to catch the creature so I could share its story with you all. Success! I danced a jig on my tiny island while my hat dripped pond water and T fished out his camera. T shot close-ups while I lifted the wet salamander into my hands, taking care to drip water on him occasionally. Dark red spots dotted the skin we'd initially thought was a plain brown. Careful as a card-house architect, I rolled the little dragon to expose his hidden underbelly, a blazing yellow with black stippling. A minute after capture, we were recording him trundling off my hand back into some submerged debris. 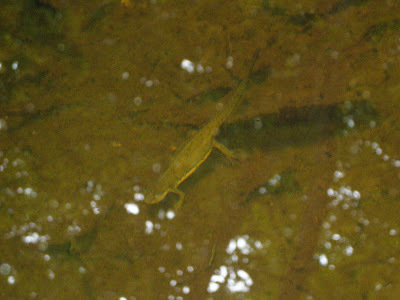 Perhaps it was my friend T's Taiwanese chi that attracted these local water dragons to us. Does everything happen for a reason? Either way, it made our day - and fulfilled one of my long-forgotten childhood dreams. The next two posts on Nature Through Noah are about the American Shad, Alosa sapidissima. I wanted to tell a story about this fish in two different styles; my usual wordy, scientific style - and an experimental style - a photo essay. As with all my writing, both posts are meant to entertain and instill an appreciation for wildlife. I would love to hear your feedback on these two different styles - was it easier and more fun to browse the photos? Or did you prefer to have prose and the factual details? E-mail any opinions to njdesrosiers@gmail.com. "So, you know, I told Tony th-FISH ON!" A conversation ends abruptly as my once calm fishing pole becomes a bouncing switch, it's convulsions the result of an aggravated silver fish that has just snatched the pointy end of the line. Fishing line whizzes off my reel as the queen of all herring species, the American Shad (Alosa sapidissima) pulls against the drag in a determined effort to free herself. There's a commotion on our tiny boat; I step over tackle boxes, around my family, and down into the metal hull; my sister reels in her line to get it out of the way; my father reaches for the aluminum net and accidentally drops it in the boat, causing a clatter. zzzzzzzzzzzzzZZZZZZ! whir-whir-whir-whir... whir-whir... splash... spli-splish! Having caught all the fish we want to eat (2 for each of us, though we're allowed 6 each by Massachusetts state law), we say our thank-yous to the fish for its fight, and release the milky-silver river queen back into her domain. We all hoot and holler and smile as we cast our lines out for another go, wondering which of us will hook-up next. Shad season is dad season. American Shad are the largest of the herring species (family clupeidae). Adults are around 2 feet long and 3 pounds, though the roe shad (females) are larger than the bucks (males). During the month of May, my father and sister and I drive to Holyoke, Massachusetts to catch them. We put our boat in on the Connecticut River just under the Holyoke Dam to intercept them on their spawning run. See, shad are "anadromous" fish, meaning that they live their adult lives in the ocean, but swim back up coastal rivers in order to reproduce. (Sound familiar? You've probably heard this before about salmon, another anadromous fish!) Shad that leave their river homes as juveniles at 1 year old may swim thousands of miles away to feed on oceanic plankton, but adults return to and spawn in the same river where they were born. As soon as these rivers reaches 58 degrees Fahrenheit in the springtime, adult fish journey upstream past natural and man-made obstacles to reach their spawning grounds. This means that the "shad run" starts first down around Florida, and ends last up in Canada. By May, they are running up the nearby Connecticut River, and I pray I am stateside with my father for a great bonding activity and a seasonal gourmet treat. Of course the Connecticut River is the primo place to find American Shad, all the locals would have you believe. And why not? Each year, between one quarter and one half million American shad swim past this one area in just a few weeks. They don't feed when they are running, but they see our "darts" (special little lures used for just this purpose) and snap at them, annoyed. They provide us with a great fight, as they are struggling for the chance to reproduce. But being foodies, we also harvest a few females for their "roe," the hundreds of thousands of unfertilized eggs stored in the female's paired gonads. Cooking the gonads in butter and parsley yields a delicious meal tasting like a lighter lobster, as my father likes to say, as the eggs are full of energy-rich oils and proteins. But I digress. I said the Connecticut River was the best place to find the shad; I didn't say you ought to join in the slaughter! Recall that shad have obstacles to pass on the journey upstream - like the Holyoke Dam. Often, we aid the anadromous fish migrations with fish "ladders," pools of water that climb like steps over the dam. But at the Holyoke Dam, there's a much more unique approach. A fish elevator! That's right; every shad that moves over the dam will be lifted by an elevator that runs continuously during the shad season. A box of water closes at the base of the dam full of shad confused at the wall blocking their path. Then, they are lifted up to the level of the dam, and poured through a long tank called a raceway. The clear acrylic wall of one side of the raceway allows computers (once, scientists with clipboards) to tally exactly how many of each species of fish is passing through. It also allows curious nature tourists to see the shad face-to-face as they are making their natural (well, in a compromise with mankind) migration upstream. And it's totally free, so put it on your calendar of great seasonal activities and check it out! Makes a great pre-father's day activity! There are no good videos of the Hadley Falls Fish Lift in action; you'll have to see it in person! For the further curious... The shad's ecological importance (as defined by us) is primarily as an energy coupling. They feed on the tiny crustaceans adrift in the sea (copepods and mysids), and are in turn eaten by our charismatic megafauna - the creatures we know and love - eagles, seals, tuna, sharks. Planktonic creatures are too small a meal for these large animals (with a few exceptions, like the Basking Shark), but the shad are an ideal food source. Their relatively short life spans and high "fecundity" (great number of eggs) mean their population growth rate is high, and thus many can be harvested without severe damage to the population. (Sharks, in contrast, have a very low fecundity, and a very late age at maturity - their populations tolerate very little harvest, and that's why shark species worldwide are becoming endangered so quickly from the massive shark finning industry.) Even so, the power of human predation has resulted in the reduction of shad landings from 50 million tons in 1890 to 2 million tons today. No, they are not endangered - but they are not as plentiful a food source for our favorite predators as they once were. And considering the other problems that these creatures face with pollution, finning, and habitat destruction, who knows how long our favorite species will be with us? I remain uncertain as to whether or not various Earth creatures will survive the next few generations of mankind's oft-cruel attentions. But by keeping my energy use low and sharing these wildlife traditions with my father and others, I fight for their existence; and I retain a living memory of any species lost in honor of their time spent struggling with us in our mutual battle to achieve modern ecological harmony on this planet.